Oriental Fire-Bellied Toads are native to Southeastern Siberia, Northeastern China and Korea. The habitat of the Oriental Fire-Bellied Toad includes mountain lakes, streams and ponds between 1,700 and 3,000 meters above sea level. Tadpoles hatch within 3-6 days; larval stage is approximately one month. They are aquatic throughout spring and summer, then they bury themselves in soft ground for winter. They live in a variety of landscapes. 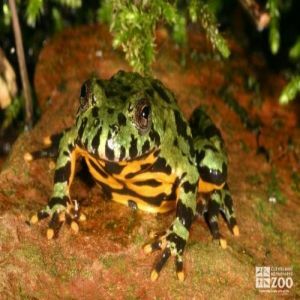 The Oriental Fire-Bellied Toad hibernates from late September/October to late April/May. Breeding in Oriental Fire-Bellied Toads occurs between May and October. Breeding pairs are formed randomly, with long reproductive periods because females deposit eggs at different times. Eggs hatch usually between early June to late July, with complete metamorphosis done by the end of August or late September.